Parking lot striping is typically the furthest thing from everyone’s mind, but in actuality something every driver tends to subconsciously notice every single day when pulling into a parking lot. Keeping your parking area freshly striped is a great way to enhance the outward appearance, and have your business stand out in Raleigh. Not only is a clean parking lot appealing, it lets your visitors know you care about your business as well as their safety. When vehicles know where to park, where to not park, which direction the traffic should flow, it simply provides safety. Having crosswalk areas defined in your parking lot will also add some added safety protection for your patrons as well. Raleigh is a dynamic and growing city so maintaining your property to look spectacular is important for all business, not only for aesthetics but also for compliance. We take pride in every job we do, and there is no striping project that is too large or too small for our crews to handle. We have loads of experience and pride ourselves on the fact that we use the highest quality traffic paint for painting the lines on your pavement. As with any project, when you use top quality materials and application equipment, along with great experience, the results will be great. We paint the straightest lines in all of North Carolina, and we ensure our line striping is consistent in width, height, as well as color. No matter the type of parking lot your business has concrete or asphalt, we are ready to be your go-to striping contractor. Skill, knowledge, and experience are three qualities needed when it comes to painting straight lines. We possess all three and have a great deal of striping under our belt from past experiences to ensure we stripe the very best every single time. We know that you need professional service, and experience when it comes to completing every task and we are here to assist. There is no job too small or too large for our crews to handle. We can take care of items as small as sweeping the parking lot all the way to a full parking lot surface repair. We also work within your schedules, so that we do not disrupt your normal flow of everyday business traffic into your business. We will work with you, and your management staff to come up with the best time for us to do the striping. We can do our work in the evening if necessary. All of this will be discussed when we come out to give you a bid. Many different safety features can be installed in your parking area to prevent damage to your property. Wheel Stops are often installed in parking stalls to prevent vehicles from causing damage to buildings, and other vehicles, and also to keep cars off of sidewalks and walkways. If you need curbing around your property, you can also install wheelstops as an inexpensive alternative. Wheel stops manufacturers have many different types of wheelstops available made from many different types of materials. Concrete wheel stops will be the less expensive option, but these can also break easily when abused by vehicles. Rubber wheel stops are more durable than concrete, but if you need parking blocks that are indestructible, steel wheelstops will be the way to go. Your budget may dictate the type of wheel stops you install, and no matter what you choose, we can install them for you. Our professional installers have experience installing all types of stops and look forward to assisting you in deciding what will work best for your parking area. Keep in mind that although wheelstops are installed as a safety feature, they can also become a tripping hazard for pedestrians, so you will need to take measures to ensure the safety of the patrons to your parking area too. Properly painted, and highly illuminated parking blocks will help ensure that your parking area is as safe as possible. Controlling the speed of vehicles in your parking lot is a huge safety concern especially if you have a larger parking area or crosswalk areas. Speed bumps and humps are great ways to slow down traffic in the parking lot. No matter the type of speed bumps you may already have, we can help you in maintaining them to get the maximum amount of life expectancy. We can also paint existing speed bumps depending on the material. We can also do installations and removal of speed bumps and as well. Vehicles can do a lot of accidental damage to your property if you do not keep it well protected. It is natural to have bollards installed near structures and crosswalks to protect your building structures as well as the safety of your patrons. Many people do not even know what a bollard is by name, but everyone has seen them and knows what they are. They are short posts that are installed to protect from vehicle intrusions and also to guide traffic. You have typically seen bollards installed around ticket booths, mechanical security gates, front entrances of buildings, around utility structures, along with the sides of crosswalks, etc. Anywhere that you need to prevent damage, you can have bollards installed. Made from commercial grade steel and reinforced with concrete, these posts are made to withstand high impact and give that added protection. Our professionals can evaluate your property and give suggestions to areas that would benefit from having bollards installed, which will protect your property. The investment to save your property is money well spent by preventing accidents from occurring. Decorative bollards can also be installed as to enhance the appearance of your building and architecture. You can also have bollards installed that provided lighting and illumination in areas that may need to be better lit at night. They are great for walkways, common areas, jogging paths, office building and hotel entrances and so much more. Our expert installers are ready to assist in protecting your property by installing bollards where needed in and around your parking area. Emergency vehicle access is a safety concern for everyone in and around your business. Police, Fire, and Ambulance services need to be able to quickly and easily access your property in the event of an emergency. When fire lanes are required on your property, you have no choice other than to have the fire lanes painted and maintained. There are specific guidelines as part of the city codes and compliance that your business must follow. Never fear we know all of the codes, and can make sure your business stays compliant. Have you received a visit from the fire marshal lately? If so, and if you are out of compliance, for sure contact us and we will be glad to come out and stripe your fire lanes. 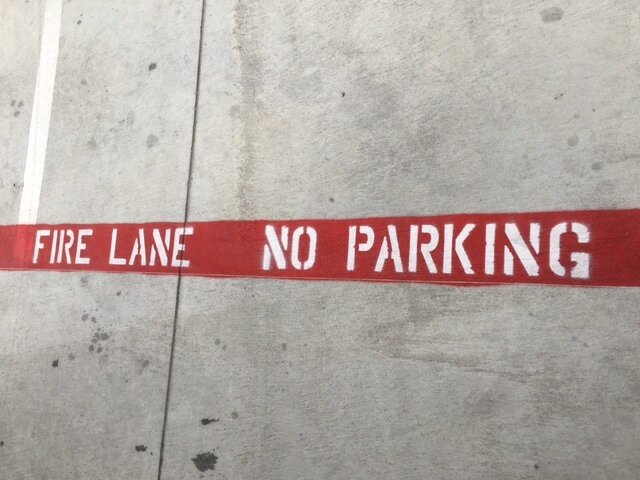 Our fire lane striping service includes the actual red fire lane, along with the stenciling of NO PARKING FIRE LANE on the entire length of the striping. We are ready to assist you with this today, so give us a call for a free estimate. We are very serious about proper striping, and staying compliant. You as a business owner are required by the 1990 American Disabilities Act (ADA) to follow specific guidelines regarding your parking lot, and a number of handicap spaces that must be present. These requirements are based on the size of your parking lot, and the amount of utilized parking spaces in every 1,000 square feet. If your parking lot is large enough, you may be required to also provide a van accessible handicap stall. 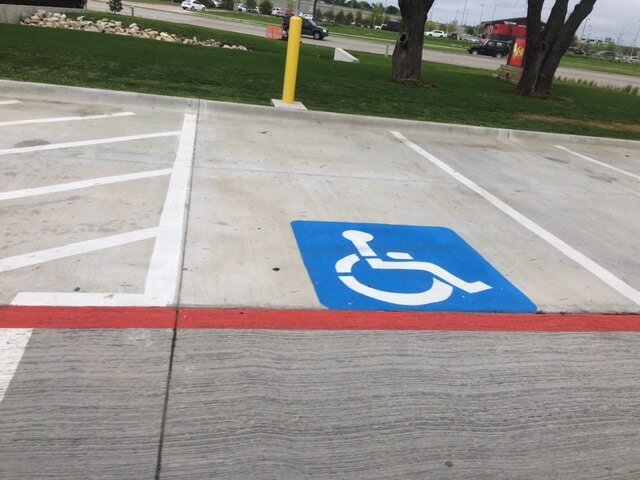 Our expert stripers will ensure that your parking lot is up to code and compliance regarding the number of handicap stalls that must be available. There are other requirements such as wheel stops and handicap stalls that we will also ensure meet code requirements. By the time we complete the job, your parking lot will be ready to pass inspection. If you have any questions regarding our pricing, or ADA compliance issues call us today. We will be glad to discuss your questions with you and provide you with a FREE quote. Protecting your investment is a big deal when it comes to parking lot maintenance. Asphalt parking lot surfaces take a beating and need to be properly maintained in order to have a long lifespan. Once a new asphalt parking lot is laid, you should apply a sealcoating within the first year. After that time a seal coat should be added every 2-3 years thereafter. The seal coating is a topcoat of protection that will waterproof the pavement and also become the wearable surface layer. This means that when heavy vehicles drive on the parking lot, and their wheels turn beneath them, this action physically breaks down the top layer. This breakdown is called abrasion, and now that you have as sealcoat layer this abrasion takes place on the sealcoat leaving the asphalt untouched and lasting a long time. The investment for seal coating is minimal versus having to do a full asphalt repair. Since sealcoating is a brand new top layer, it will make your parking lot look brand new. Add on top a fresh striping job and your parking lot will look stunning. 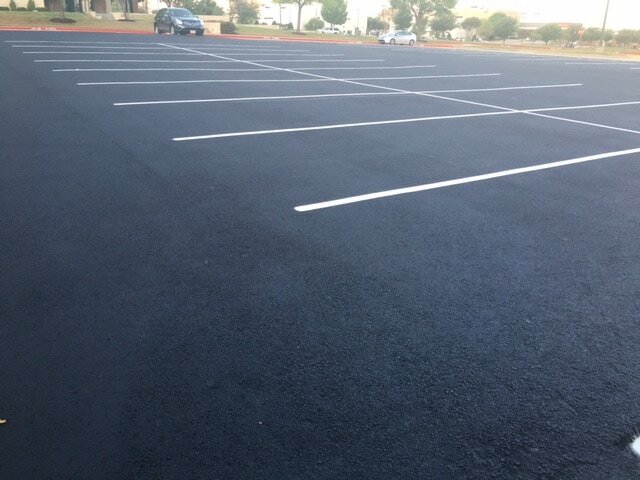 Everyone will be impressed with how great the parking area looks once you have hired us to add a sealcoat protection to your asphalt parking area. Raleigh, as you know, is a quaint, and beautiful city. We receive joy knowing we are helping to keep Raleigh looking great every time we revive a parking lot and make it look spectacular again. Earning your business is important to us, but keeping you as a life-long customer is even more important. We do service many different types of businesses in Raleigh and wanted to share a list of great businesses we already do striping for every day. If you do not see your business listed, let us know and we will add you to the list. If you have a parking lot, we will be able to assist you. We also do warehouse striping and an occasional sports field. Getting a fair price for having your parking lot striping work is always a top priority for all business owners. Rest assured we have the most competitive prices in all of Raleigh and we look forward to providing you with a FREE quote. Every striping job is unique because each parking lot is different from the next. 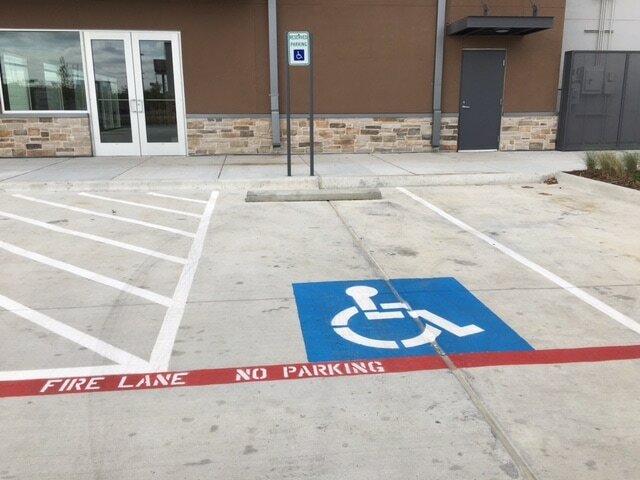 Once we know the numbers of spaces to stripe, the linear feet of fire lane you have, the number of handicap stalls and stencils needed, and any other items that may need to be service, we can give you an accurate quote. Simply give us a call today, and we will schedule a time to come out and preview your parking lot, in order to give you the most accurate pricing possible. You will love the work we do for you, and we can't wait to get started on your project.